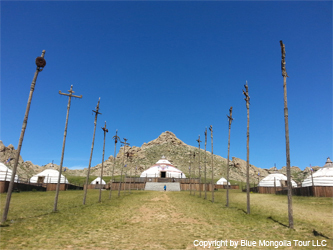 13 Century Cultural Park comprises Chinggis Khan's statue and museum halls and Live museum "Town from 13 century". The ancient town live museum is located in the distance of 130 km east of Ulaanbaatar in area of Erdene sum of Tov Province. It takes 2 hours driving on paved road. A 40 meter statue of Chinggis Khaan mounted on horseback and holding horsewhip will be discovered on the way to Alive museum of 13 th century. 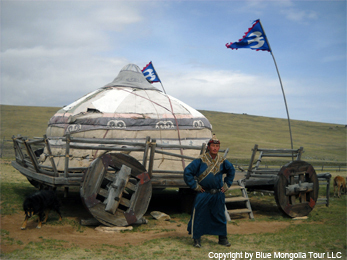 The musem displays the authentic lifestyle of mongols, who were living in Chinggis Khan's period and offer travellers real experience and real feeling on travel this ancient world. This place gives them a feeling of that travellers came to ancient time in time mashine. The complex is consisted of 350 hectare field and it consists of 12 main complex areas and have lots of animal collection such as mongolian dog, wolves and eagle. 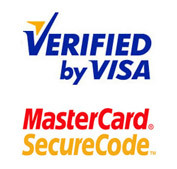 Travellers will walk in this city or they can rent horse or camel passing through this city at no charge. Warriors, who are dressed in ancient national costumes-armours and holding spears and swords, will greet travellers near the main gate of this mini world. Travellers should get the Gerege /used as passport in 13 th century/ and they have right to enter the city. 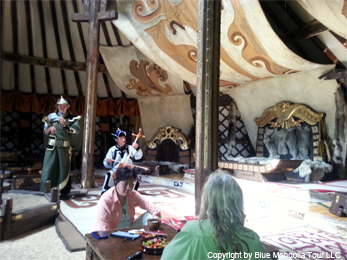 Warriors, who are dressed in ancient national costumes-armours and holding spears and swords, greet travellers near the main gate of this mini world. Travellers should buy the gerege /used as passport in 13 th century/ and they have right to enter the city. 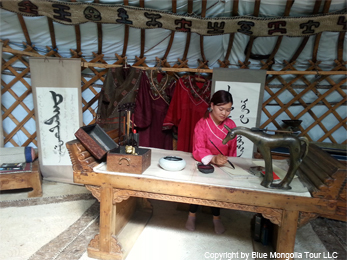 Explore mongolian ladies, who are sewing national clothes, craftsmen, who are doing some decorative things and applied art works, men, who are making swords and spears near the fire, and other people, who are doing householding items for themselves. Royal family people live here and their ger is open to travellers. Explore how the roatl people dressed and how they lead the state work, meeting, and how they enjoy in palace performance. Educated people are living and doing their paper works, history books anf inventing mongolian Yigur alphabet in this gers. 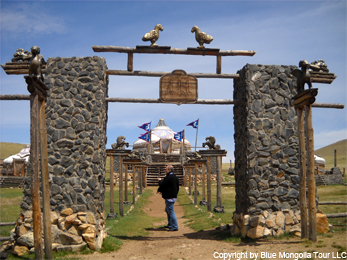 Travellers can have their names written in old mongolian script. Explore there how nomads: horsebreeders, shepherds and cattle breeders are living in small different gers and what they are eating and drinking. 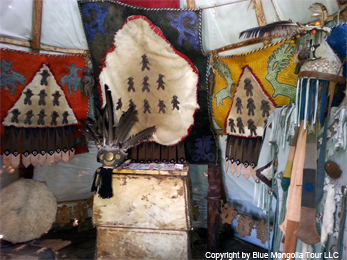 Most of mongols believed in shamanism in 13-th century, so this gers show how shamans are living and what they are doing for public and for the state. Here explore how the hunters are hunting with their eagle or in special tecnics of archery shooting. Explore the blue skins and furs of hunted animals processed by hunters. Explore how the pilgrimagers and refugees are living and in this place. Walking in the commercial street and change your USDollars into 13-th century coins and “shopping” in ancient market. Travellers can have rest and relax and enjoy some special service for travellers.